Clearer, stronger, brighter safety signage, from a photoluminescent film accredited by the PSPA as delivering high performance even under low lighting conditions. For HD sharpness and production efficiency in a safety film that charges faster, choose Glo-Brite® 7555. 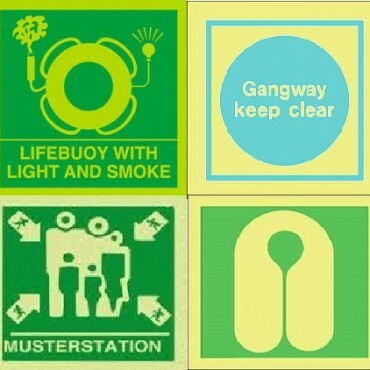 Safety signage in building, marine, rail and military environments. Why Jessup Glo-Brite® 7555 photoluminescent film? HD sharpness: Razor-sharp edge definition and rich, consistent colour density. So your safety signage remains clear, strong and unambiguous. Brighter in blackout: The latest generation of Jessup Glo-Brite® safety signage tapes and films use photoluminescent pigments that produce a brighter afterglow in blackout conditions and charge faster in the light. Easy printing: Solvent. Eco-solvent. UV. Whatever inks you choose, and however you print them, Glo-Brite® 7555’s exceptional ink adhesion means edges are crisper and colours sharper. Excellent layflat characteristics make working with Glo-Brite® 7555 easy. Quick drying: Faster drying improves production rates and efficiency. Performance: Even in harsh exterior environments, the UV stable pigment and superior ink adhesion ensure your signs retain their integrity and durability. Glo-Brite® 7555 photoluminescent tape exceeds the performance requirements of PSPA Class C (high performance in low lighting conditions). It contains none of the substances of very high concern (SVHCs) or banned substances as identified by the REACH standard. NOTE: For full technical information please ask for a data sheet.